Royalty parade in Piazza San Marco at the annual Carnevale in Venice, Italy. 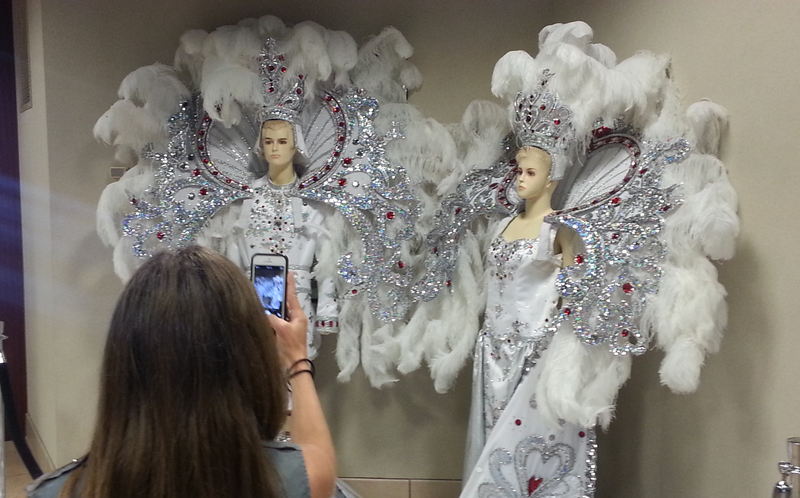 Mardi Gras King and Queen costumes on display in Lake Charles, Louisiana. Here’s our top 15 places for party-lovers and Catholics everywhere to commemorate Carnival, Mardi Gras and other pre-Lenten festivals. A traditional period of celebration that begins on 12th Night in January, and culminates on Mardi Gras or Fat Tuesday (also called Shrove Tuesday), it’s always celebrated 47 days before Easter to mark the first day of Lent. New Orleans’ Mardi Gras may be the most famous celebration, but there are many great family events in small town USA, many Caribbean islands, Quebec, and Europe’s most glamorous locales. It is such a popular and colorful festival that for many travelers, it’s the prime reason for a family winter vacation. New Orleans is Mardi Gras, and preparations begin in early January with events scheduled for weekends leading up to this year’s Mardi Gras, Tuesday, February 13, 2018. There will be nights of festive parades by Krewes (secret societies which compete for the most lavish floats) and marching bands beginning two weeks prior to Fat Tuesday; though often unsuitable for children and modest adults, these late-into-the-night events are great fun. In recent years, David Copperfield, Kevin Costner, Laurence Fishburne, The Shirelles and other celebrities have joined in the effort to celebrate life’s excesses. There are also many good-clean-fun activities to choose from. The garden district area of St. Charles is a major tourist attraction, and visitors find many local families staking out their positions throughout the festive season, having picnics, playing ball, and having fun under the beautiful oak trees. Parents of younger kids won’t have to worry about the streetcars, as they stop running in this area during Mardi Gras. Families can visit Mardi Gras New Orleans for a schedule of festivities, as well as to determine which hotels have available rooms for this period. If you’ve got wheels, the NoLa tourist office suggests a drive to the suburban areas such as Metairie, only 10 minutes away. Metairie’s Caesar Parade, held the Saturday, February 18, 2017, is the parade featured at Orlando’s Disney World on Mardi Gras day, making it extra special for kids to see. Alternatively, you can take the kids to explore Mardi Gras history at the Louisiana State Museum’s “Mardi Gras: It’s Carnival Time in Louisiana” exhibit at The Presbytere or visit Mardi Gras World and show them how floats are designed and made. Safety First: Arrive early to orient everyone before the crowds pile in. Make sure the kids know where to go if you get separated in a crowd, label their clothing in case they get lost, make sure they stay clear of the floats. Bring supplies: Pack snacks, extra toiletries, a cell phone. A picnic basket and an umbrella are for just in case. Bring a large carryall: Passing parades toss out beads, candy, stuffed animals and more known as “throws,” a tradition dating to the 1870s. There are sure to be souvenirs that kids will want to keep. Dress comfortably: Comfortable shoes, some rain gear and an extra layer may come in handy. In America’s own Mobile, Alabama, locals claim they’ve celebrated the day before Ash Wednesday since 1703, when their fair city was the capital of France’s Louisiana Province. The fun at “America’s Family Mardi Gras” as they like to describe themselves, begins on Dauphin Island and continues from late January 30 to February’s Mardi Gras with weekend festivities and parties. On Mobile Mardi Gras Tuesday, the biggest parades and lavish costumed events occur. If you are there for it, please tell us all about the scheduled Order of the Polka Dots Parade! If you’re too late to catch the celebration, be sure to stop by the Mobile Carnival Museum, a small private home which features all the fun of carnival. The Mobile Bay Tourism Office has top value lodging options and other events information as well. Pensacola, Florida is better known for its Blue Angels than its extensive Mardi Gras party, but it’s quickly become a local tradition. On Saturdays from early January to the end of February, families are more than welcome at galleries and local festivities. Expect to join in the bead throwing as parades pass by, and the catching of moonpies as they are tossed from floats. Contests and Cajun food festivals abound; count on the Krewe of Lafitte Illuminated Parade to be great fun for all ages. If you can find accommodations, they’re usually a very good value during this period and with any luck, the weather will be fine. If the celebrations in New Orleans sound a little overwhelming, head to Lake Charles instead for Louisiana’s second largest, decidedly more wholesome, SWLA Mardi Gras event. The fun begins in January at the Twelfth Night presentation of courts, when each person walking in the door gets a piece of King Cake and a grand prize. In the following weeks, there’s a Cajun Extravaganza Gumbo Cook-Off and a parade for Children’s Day. Attend the Royal Gala the day before Mardi Gras, then on Fat Tuesday itself get a little country-wild at a Chicken Run in Iowa, LA. Afterward, head back to Lake Charles for the main event – the Krewe of Krewes Parade – where there’s a child-friendly alcohol and tobacco-free zone to keep the kids amused. Visitors should also check out the Mardi Gras Museum of Imperial Calcasieu, featuring the world’s larges Mardi Gras costume display. Take a look at Southwest SW Lousiana Mardi Gras for more info. Heading west and close by, Port Arthur, Texas is the home base of this local festival. The Cajun-style holiday is celebrated over the weekend prior to Fat Tuesday, with a boat parade, laser show, zydeco bands (kids under 12 enter free) and lots of barbecue. There are pony and camel rides, and a Munchkin Mardi Gras parade is on Sunday, offering families a chance to play at the midway, arcade games, bouncy Moon Room and more. Not the best season to visit what is usually a popular summertime resort area, nonetheless, the hotels (most major chains are represented here) are a bargain and there is a full schedule of free, family-worthy events. Check out Southeast Texas Mardi Gras for the current attractions. If you are searching for a Mardi Gras celebration that is slightly tamer than New Orleans, welcome to Biloxi, Mississippi. This Gulf Coast town knows how to party in a big way, while keeping it entirely family-friendly. Mardi Gras in Biloxi holds festive events for several weeks prior to Mardi Gras, but the main event is on Fat Tuesday, with a parade that is bursting with music, dancing and merriment. Everyone lines the streets pleading for the various Krewes to throw them Mardi Gras beads from atop their floats. The coronation of the Mardi Gras King and Queen is held on the eve of Mardi Gras and everyone is welcome to attend. Locals put on their finest clothes for this event, but you can dress as casually as you like. If the weather cooperates, the kids can take a break from the celebration and stroll barefoot in the sugar-soft sand, before climbing the spiral staircase to the top of the old-fashioned lighthouse. The view of the coastline and the legendary Gulf of Mexico oil rigs offshore is just super. Many other Catholic cultures around the world have their own celebrations, and NoLa’s sound advice for families (above) applies to watching or partaking of Carnival celebrations anywhere. Note that while most of the Caribbean islands hold wonderful festivities and traditional contests in honor of Mardi Gras, many have shifted their celebrations away from the Lenten period to the summer or other busy tourist times to enhance the destination’s tourist appeal. In Rio de Janeiro, Brazil, the many nights of Carnaval’s raucous street parties, parades and dance-a-thons take on the colors, sensual sounds and picante flavors of Brazil’s African heritage. Beginning the prior December and continuing weekly through Carnival Sunday are dozens of samba school lessons, costume workshops and other preparatory events to build the carioca spirit. Only cheap seats for the bleachers will be left for the Samba Schools Parade held the Sunday and Monday before the big day, Mardi Gras; each school’s 80-minute parade may have up to 10 floats and 4,000 participants. Riotur is able to provide some information about how you and your family can rent a costume, join a samba school parade (after taking dance lessons, of course) and participate in one of the greatest shows on earth. The Sao Paulo Carnival celebration is very similar to those in Rio, but the “samba schools” take dancing to the next level with festive competitions. The less-internationally famous Carnival in Recife is a past winner of “world’s largest carnival parade” (based on number of participants) according to the Guiness Book of World Records. Note that Zika virus has made travel to Brazil especially dangerous for pregnant women, so check the CDC website for the latest travel advisories. Whichever Brazilian city you decide to explore, each has its own unique perspective on Carnival celebrations. On the lesser known island of Dominica, between the French islands of Guadeloupe and Martinique in the Eastern Caribbean, Carnival or Real Mas events begin about six weeks prior to Fat Tuesday and often continue a few weeks after. Highlights for families include the Carnival Queen show, steel band and calypso competitions and the Kiddies Carnival at the fairgrounds in Bay Front. Since music is such a big part of the fun, Dominicans vote for both the Soca and Calypso stars of their country on Jump Up! Monday and Tuesday; the Calypso King is chosen from a competition concert in Roseau. For information on accommodations, visit Dominica tourist information. All around Germany, cities with a largely Catholic population celebrate with parades, costume balls, puppet theaters and carnival choruses. The exact time of celebration and the traditions vary from county to county, but Karneval or Fasching generally takes place in early spring. Munich, Cologne and Mainz are strongholds of Mardi Gras celebrations. Some highlights: In Mainz, home of the Gutenberg printing press, there’s a children’s costume parade with thousands of youngsters, many in elaborately decorated floats, taking part. Cologne (or Koln) celebrates annually from the date of 11/11 at 11:11am, culminating on Rose Monday (Rosenmontag), when the city hosts Europe’s largest float-filled parade. In the Bavarian capital of Munich, revelers enjoy the famous Fasching doughnuts, an annual treat purchased –– and consumed –– by the dozen! For schedule information, visit the official German Tourist Office site. The fun doesn’t have to end on Mardi Gras day. For a first hand account of one family’s post-Fasching celebration in Heidelberg, read Jaclyn Stockton-Sooy’s account of her Karneval-inspired German vacation. In a country where everything is high style, the colorful Carnevale di Venezia in Venice is the largest Carnival celebration, running about two weeks. As tradition has dictated since the year 1296, festivities begin on weekends, then become nightly events of strolling citizens clad in elaborate, themed costumes and masks as Fat Tuesday (Martedi Grasso) approaches. 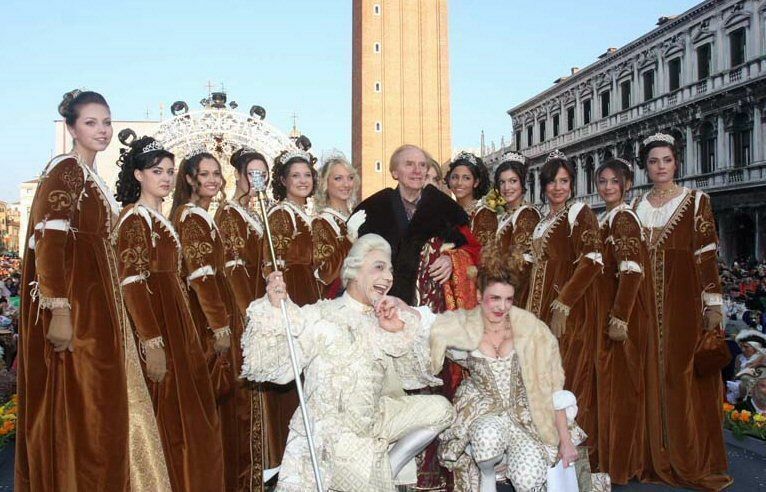 This year’s food, fashion and music parties, in addition to parades, will entertain visitors not only in the Piazza San Marco and on the Grand Canal, but in the Casino and many other neighborhood squares as well. Giovedi Grasso and Martedi Grasso are the biggest nights, but don’t miss the special Kid’s Fete and the Best Mask for Children Contest at Piazza San Marco. Masks are popular with all ages, and with people from all walks of life, and usually represent characters from classic Italian folk tales. We never said Venice was cheap, and it’s certainly not at this damp and chilly time of year, but the new Venezia Unica Venice City Pass Card that gives you admission to the top attractions for a certain number of days, is a bargain. Lucerne’s Carnival celebration begins early in the morning of Fat Thursday with the urknall, a load explosion. The evening before, a guuggerbaum, or Carnival Tree is erected as a symbol of the United Carnival Bands of Lucerne. Festivities include guggenmusigen, (carnival musicians) and masked revelers throughout the city, parades, decorated floats, band concerts, and a children’s parade all culminating on Fat Tuesday with the Big Parade of the Carnival Bands. For more information visit Luzern/Carnival. Families will find somewhat toned-down celebrations in Mexico, where Catholics spend five days enjoying music, dance, parades and feasts before the arrival of Lent. Known for its Afro-Caribbean-influenced culture, the port city of Veracruz hosts Mexico’s largest Carnaval; its parade features danzon and batucadas, Draculas, drag queens and women in outrageous sparkling dresses dancing to the Caribbean – Spanish rhythms along Miguel Avila Camacho Boulevard. Take your outgoing kids to the historic zócalo, or central square, to join in the evening events which begin on the first night with the “Burning of the Bad Mood,” a ritual that exorcises illness, economic problems, bad weather and other public events that have marred the previous year. Smaller Carnaval celebrations are held in Merida and Cozumel (for families visiting the Cancun area), Ensenada (easy for those coming from Los Angeles) and La Paz. The narrow streets of Mazatlan fill with organized parades of masked and costumed dancers, local mariachi, live bands with tambora drums from Cuba and the Caribbean, and visiting revelers. This period of five days prior to Mardi Gras is more fun than Spring Break and room rates are lower! The oceanside Malecón running along Olas Altas Beach downtown is the prime parade route; grab a spot and watch the regional Sinaloenses bands with lots of brass, passing paper mache floats (some very elaborate) and performing rock groups. Food festivals are organized in the Zona Dorada and the Plaza Machado, and there is an on-going fair with amusement park rides for all ages running for about two weeks. The twin island republic of Trinidad and Tobago (T&T), the most southerly islands in the Caribbean, celebrate Carnival as part of their multicultural history. After Boxing Day, it seems the entire nation focuses on dance lessons, costume making, the artistry of masks, music rehearsals in preparation for Panorama (the steel pan orchestra play-offs) and Soca dancing. Each week in January and February brings new events and contests, leading up to a Junior Panorama Steel Drum play off and Junior King & Queen of Carnival competitions. From dawn on J’Ouvert or Carnival Monday — when parade-goers slather themselves in chocolate, mud and oil paint — through the night of Mardi Gras (Carnival Tuesday), the festival unites local and foreign communities in celebrating a proud Caribbean tradition. For more information on this densely packed schedule, visit the Trinidad & Tobago Tourism website. In fact, any family traveling during this period should check with the local tourist office to see what the locals have in store. This season, we’ve noted celebrations from Universal Studios Orlando to Cuba, wherever the party spirit lives on! Mardi Gras in the United States is much more than just the big party in New Orleans. There are eight great U.S. cities (Galveston Texas, Houma Louisiana, Lake Charles Louisiana, Mobile Alabama, New Orleans Louisiana, Pensacola Florida, San Diego California, and St. Louis Missouri) that celebrate Mardi Gras in a big way. Mardi Gras in the U.S. was actually first celebrated in Mobile, Alabama. Because the Mardi Gras season lasts from early January through mid-February, with dozens of events in some cities, there are plenty of opportunities for families to experience Carnival. Thanks for such great information, really appreciate knowing more about mardi gras and where families can celebrate. It's such a great holiday and the Carnival events are really fun.